The 2014 Toyota Grand Prix of Long Beach (TGPLB) marks the 15th time for Rahal Letterman Lanigan Racing (RLL) to compete in the event. RLL’s second place finish in last year’s IndyCar race by Graham Rahal followed a 1-2 finish by the team’s sports car program on Saturday and will be hard to top this year but RLL is looking forward to the opportunity to try. Although the team didn’t compete in Indy car races here from 2004-2011 while they fielded a fulltime entry in the Indy Racing League (2004-2008), they did compete in the 2003 and 2004 Atlantic races with Danica Patrick and in the 2007 American Le Mans Series (ALMS) race. In 2009, the team returned to the streets of Long Beach in the ALMS with BMW Team RLL and finished on the podium each year since then including a win in 2011 with Joey Hand and Dirk Müller and a 1-2 finish last year with Bill Auberlen and Maxime Martin (1st) and Dirk Mueller and Joey Hand (2nd). Mike Groff (1994), Raul Boesel (1995), Bryan Herta (1996-1999), Max Papis (1999-2001), Kenny Brack (2000-2001), Jimmy Vasser (2002), Jourdain (2002-2003), Takuma Sato (2012) and Graham Rahal, James Jakes and Mike Conway in 2013. In total, the team won three poles (Herta 1998, Vasser 2002, Jourdain, Jr. 2003); made five front row starts including an all-Team Rahal front row in 1998 (2nd – Rahal 1998, Brack 2001); earned their best finish of second place four times (Rahal 1992-1993, Vasser 2002, G. Rahal 2013) and earned six podiums (2nd – Rahal 1992-1993, Vasser 2002 & G. Rahal 2013; 3rd – Herta 1998-1999). In 2013, Rahal qualified 11th and finished second. James Jakes qualified 13th but was hit at the start and ultimately finished 12th despite a slow first pit stop due to a left front issue and Mike Conway qualified fifth but retired after mechanical failure. The team has prepared four cars for the Long Beach weekend – two of which are entered in the Toyota Grand Prix of Long Beach Verizon IndyCar Series race on Sunday including the No. 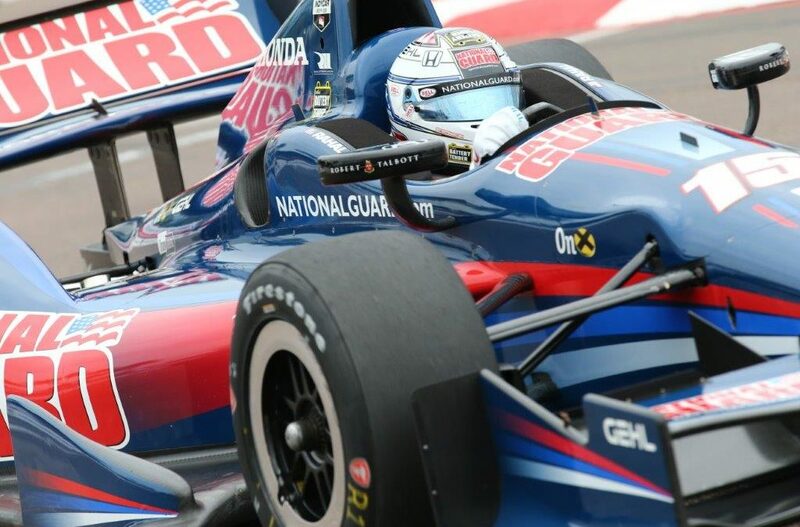 15 National Guard entry for Graham Rahal and the No. 16 Rahal Letterman Lanigan entry for Oriol Servia. The team also prepared two entries under the name BMW Team RLL that will compete in the GTLM class of the United SportsCar Series race on Saturday. Sunday’s race will be Graham’s eighth Champ or Indy car race here, ninth overall, and second for his father’s team. In 2013, he finished second after starting 11th. In 2012, he qualified 15th for Service Central Chip Ganassi Racing (SCCGR), started eighth due to penalties to Chevy-powered teams, ran as high as fourth but finished 24th due to contact with Marco Andretti. In 2011, he qualified 16th for SCCGR and finished 13th. In 2010, he started and finished 22nd for Sarah Fisher Racing after contact. In 2009, he started seventh and finished 12th for Newman/Haas/Lanigan Racing (NHLR). In 2008 he started ninth and had a podium in sight when he was alongside third place but contact during this pass led to a 13th place finish with NHLR. He started fifth in 2007 but the pit strategy of others and slow fuel flow related to teething problems for the all-new Panoz Champ Car on two stops limited his finish to eighth place with NHLR. In the 2006 Champ Car Atlantic Series race here he started seventh and finished fifth. The 2014 Toyota Grand Prix of Long Beach will mark the 13th race here for Oriol and his first with RLL at this track. His best finish is second in 2007 with Forsythe and best start is fourth in 2011 with Newman/Haas Racing. In 12 events, he has earned one podium (2nd in 2007), one top-five and five, top-10 finishes. He retired with mechanical failure four times and once after contact. Of his many races here, Servia is hard-pressed to find one that wasn’t memorable. The Toyota Grand Prix of Long Beach, Round 2 of the 2014 Verizon IndyCar Series season, will actually be Servia’s season-opener as he did not compete in St. Petersburg. It was previously announced that the team will prepare an entry for Servia in races at Long Beach, Barber, and the road and oval courses at Indianapolis Motor Speedway. “I was in St Pete with the team assisting with anything I could but mostly to follow every step of the way almost as if I was driving myself. I also took some notes on how to do a spectacular start! Did you see Graham’s start?